The actor Ichikawa Shinjûrô III held the name of Ichikawa Fukunosuke I from July 1874 to May 1888. Born in Ôsaka the 24th of June 1885. His father was a man named Inoue Dennosuke. He started his career as a disciple of Ichikawa Udanji I and made his debut on stage (hatsubutai) in May 1890 in Ôsaka at the Bentenza, where he received the name of Ichikawa Fukunosuke II. He left the Kabuki world for a few years and joined in Kyôto Ittôen, a religious community which was founded in 1904 by Nishida Tenkô. He went back to the Kabuki world and took the name of Ichikawa Shinshô IV in October 1916 at the Naniwaza. He definitively left the Kabuki world in 1929 to become a permanent resident of Ittôen, along with his family. He founded a theater troupe within Ittôen, named Suwaraji Gekidan, and did several tours in Japan with his troupe. He died the 22nd of December 1935. Born in Ôsaka the 21st of March 1904. His father was in the printing business. He started his career as a disciple of Ichikawa Udanji II and made his debut on stage (hatsubutai) in October 1920 in Ôsaka at the Nakaza, where he received the name of Ichikawa Tsurunojô and performed in Shinoyama Gin'yô's drama "Rokuhara Eiga Monogatari". 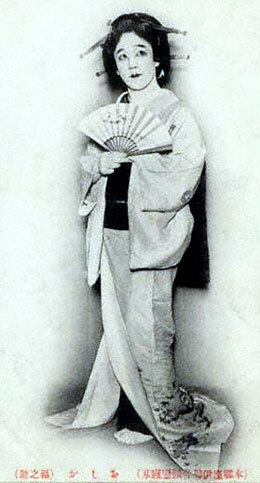 He settled in Tôkyô in 1929 and performed in koshibai venues, like the Miyatoza or the Kotobukiza. He became nadai in 1932 and celebrated it in November 1932 at the Miyatoza, where he played the roles of Osan and Koharu in the drama "Shigure no Kotatsu". He joined the Tôhô Gekidan troupe in 1935 and took the name of Ichikawa Fukunosuke III in September 1935. He became a disciple of Ichikawa Sanshô V in January 1939. After the war, he performed for a few years in the Katabamiza troupe. He became a disciple of Ichikawa Ebizô IX in 1950. In his latter years, his atariyaku were Gonta's mother in "Sushiya" or Koman's mother in "Sanemori Monogatari". He appeared on stage for the last time in October 1983, in Tôkyô at the Kabukiza, where he performed in Hôjô Hideji's drama "Kasuga no Tsubone". He retired afterwards and died the 4th of August 1990. Born the 24th of November 2005. This child actor started to perform as a koyaku in July 2011 at the Shinbashi Enbujô, performing in the drama "Edo no Yûbae". He became the heyago of Ichikawa Ebizô XI and received the name of Ichikawa Fukunosuke IV in November 2015 at the Kabukiza, where he performed in the drama "Wakaki Hi no Nobunaga".